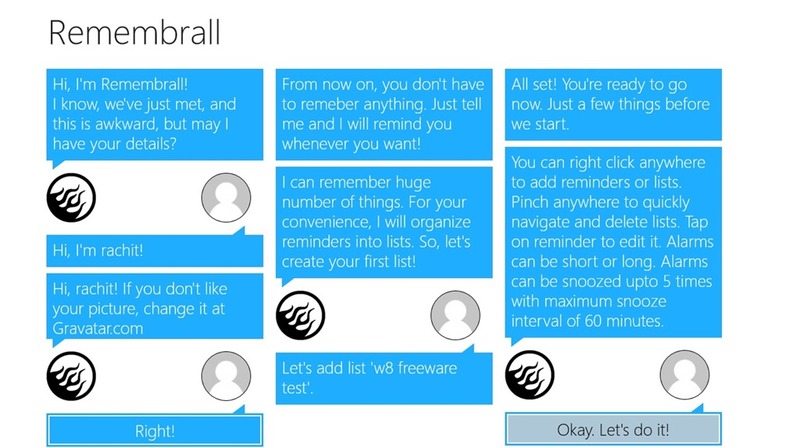 Remembrall is a free Windows 8 Reminder app. You can use it to set reminders for the important stuff you have to do. The app will then remind you of the stuff on the exact time. The app can remind you even if you are playing games. You can add snooze to this Windows 8 Reminder app, which might be helpful if you want to delay the reminder for a few minutes. The reminder can be snoozed maximum 5 times. You can add time interval to the snoozer for upto 60 minutes. Enable audio to your Reminders if you need to. This Windows 8 Reminder app is freely available in the productivity section of the Windows Store. Using it is quite easy and fun. Let’s get you better introduced with it. Whenever you use it for the first time, the Reminder assistant of the app will notify you to submit some details like your name and e- mail ID. When you provide these details in this Windows 8 Reminder app, the assistant of the app would notify you to make the list of reminders you want to add. It’s necessary to make a list, because this Windows 8 Reminder app requires a list to set reminders. 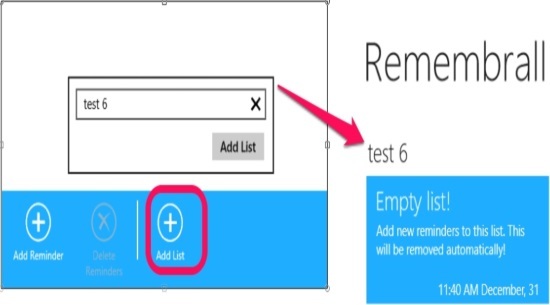 You can make use of the bottom layout of this Windows 8 Reminder app to add new list to which you can add reminders. The bottom layout appears on right clicking on the app. Now, click on the created list to add details about the reminders. Or, you can use the bottom layout. Using the options that are available to add Reminder Details, you can set the things like time, Date, any description about the reminder in general, notification settings like setting it to be of long duration or not, and also setting the snooze on or off. Use the Snooze option to set the the number of times you want it to repeat. Plus this, from here you can define the interval for Snoozing. Depending on the settings you have made and on the specified time, this Windows 8 Reminder app would notify you about the stuff you have to do. Also check Reminder Toast, Reminder, and Windows 8 birthday reminder apps. No limit on setting reminders: Set as many reminders as you want. 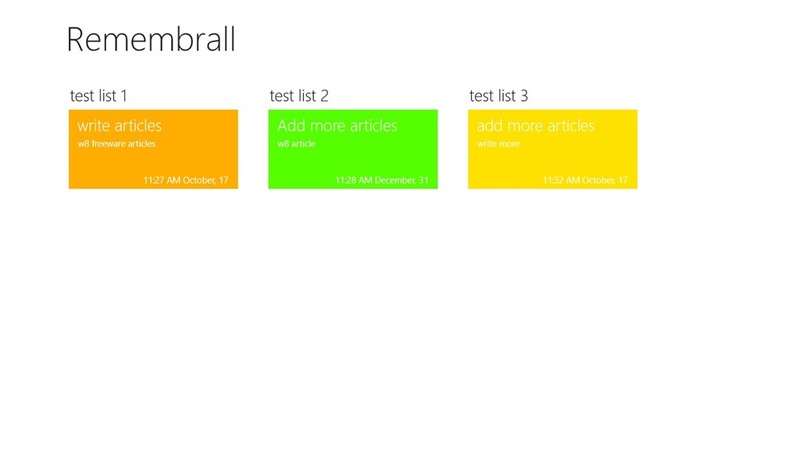 Ease of working: Setting reminders using this Windows 8 Reminder app is quite easy. Nice Interface: The interface of the app is quite nice. Ability to add looping sound (built-in) to your reminder. You can use the snooze option also; can snooze for up to 60 minutes, with a capability to repeat the reminder five times. 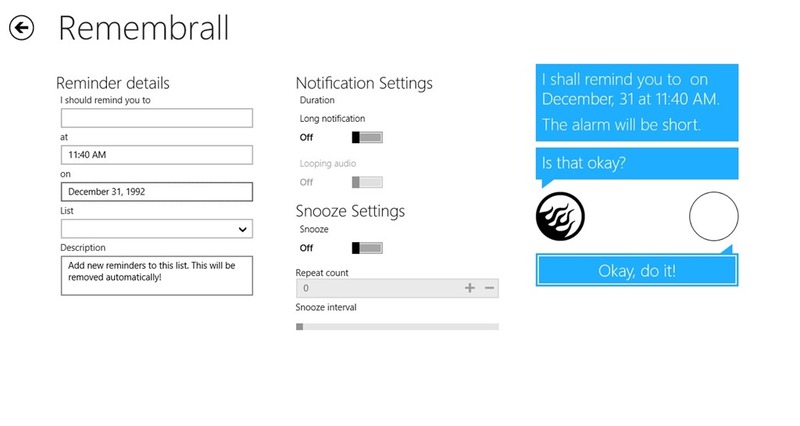 Free availability: This Windows 8 Reminder app is freely available in the Windows Store. I used this Windows 8 Reminder app myself and was quite satisfied. However, had there been an option to add audio files to the reminders from local media, the app could have been more impressive.